The idea of concocting a non-Japanese dish with miso paste as a key ingredient would alarm many Brits. However, this was exactly the challenge set to the P&W team by our Japanese Account Director and Senior Designer, Akiko. For most of us (including pretty much everyone on the P&W team), using a fermented soybean-fungus and creating a flavour fusion did not, initially, sound like culinary bliss. 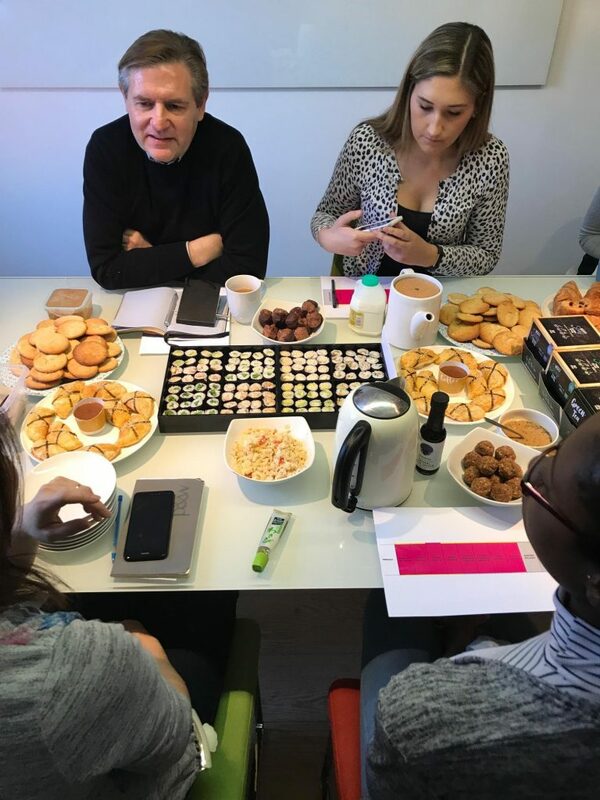 The brilliantly daunting miso experiment was pitched to our enthusiastic (yet slightly sceptical) team at our weekly Monday Morning Meeting two weeks ago. During the meeting, Akiko provided every member of the P&W team with a container with one of two different varieties of miso paste and explained our challenge. The two varieties dished out were both light in colour: Rice Shinshu Miso (Marukome Ryotei-no-aji Mutenka) and White Miso (Miko Shiro Miso). 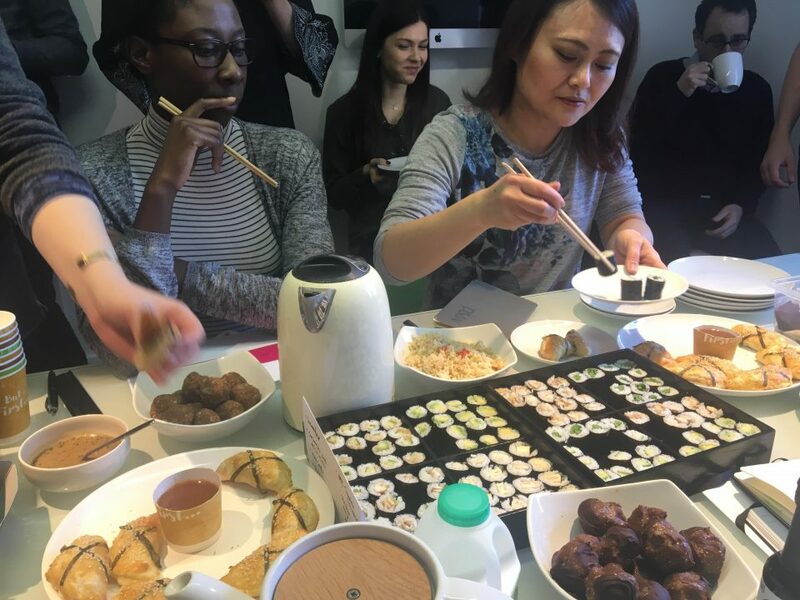 Akiko, accustomed to using miso in a very traditional way (for example, as a soup, as a marinade for fish and chicken, to pickle vegetables, and as a flavour enhanced to cooked Japanese dishes), was intrigued to see what unconventionally weird and wonderful dishes our creatively minded team would fashion! Using miso in a traditional Japanese way was forbidden; we had to get creative and use our imaginations. So, a brief overview of what miso paste actually is. Basically, it’s an intense explosion of flavour. The creamy, salty, nutty paste has a rich umami flavour (the ‘fifth taste’). Ranging from white to red to dark brown in colour, miso often looks like a thick and grainy nut-butter. It is incredibly versatile, but before undertaking this challenge many of us, including myself, had no idea it could be incorporated into non-Japanese dishes, let alone desserts! Considered an ancient art form, miso has been created for over 1,300 years from fermented soy beans (or other legumes or grains), with salt and gut-friendly koji mould (Aspergillus oryzae). It is naturally high in protein, rich in vitamins, abundant in minerals and full of antioxidants. In case you’re new to this, fermented Asian foods have been highlighted as a ‘2018 UK food trend’. If you haven’t yet jumped on to the bandwagon, deem this blog your call-to-action! Although many Brits may instinctively turn their noses up at the thought of fermented food, we actually eat it all the time: vinegar, bread, yogurt, cheese, beer and wine to name some of the most popular (and don’t forget Yakult- does anyone still drink it?!) Fermentation has been used as a preservation technique in cuisines worldwide world since Neolithic times to not only preserve food but to add nutritional value, alter the way a food looks and tastes and provide new flavours and textures. The idea of good gut health is not a new concept to us, but today’s consumer is now searching outside the probiotic yogurt section of the dairy aisle towards other more exciting and exotic foods, thus, fermented Asian foods are now leading the way. Delicacies such as kombucha and kimichi have officially entered the mainstream alongside Kefir, a cultured, fermented milk drink (thought to contain 30 strains of beneficial bacteria) which is also becoming a fixture on supermarket shelves. Miso and soy however, remain firm favourites in the UK. World-renowned restaurant Nobu (a firm favourite of Hollywood star Robert Di Niro), has helped to increase the fermented paste’s popularity with its signature sweet-savoury fish dish; Black Cod with Miso. The simple and delectable recipe, created by legendary Chef Nobu Matsuhisa, has become a trademark dish for the restaurant. Marinating black cod in a mirin-sake-miso marinade for two or three days creates an incredibly delicious and tender dish that is very easily to replicate at home (as an umami-lover, I’ll be trying this soon!). 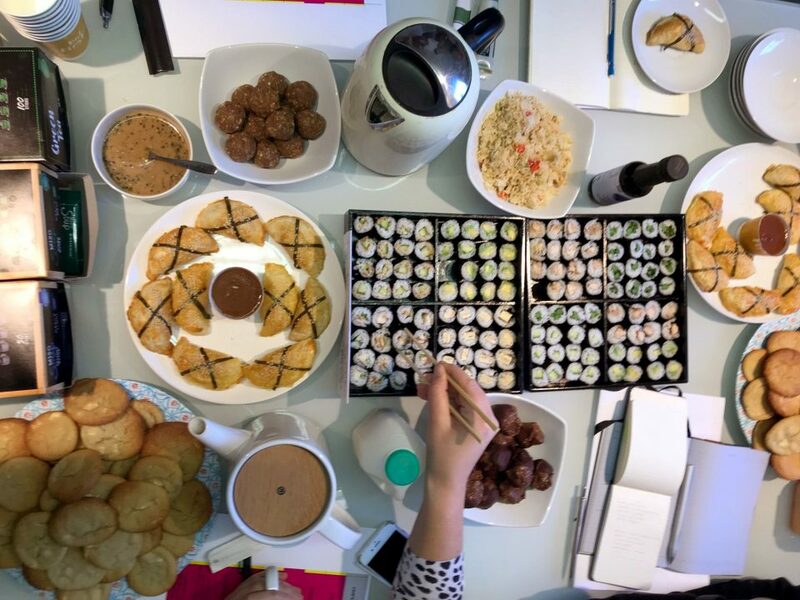 Fast-forward two weeks to today and we all gather again for another Monday Morning Meeting, this time to share our marvellous miso creations! 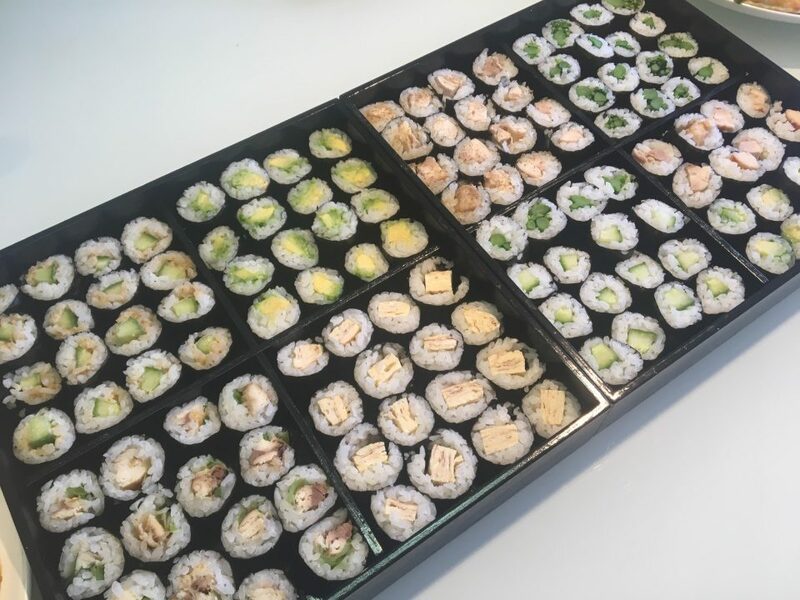 To accompany our usual breakfast croissants and breakfast tea (for the less-adventurous), Akiko generously created two beautifully-presented boxes of delectable traditional sushi rolls (Hosomaki) with a variety of fillings, including tender-stem broccoli, avocado, egg-omelette, mackerel and miso-marinated chicken. We even had some strong gluten-free Tamari soy sauce to dip the sushi in. 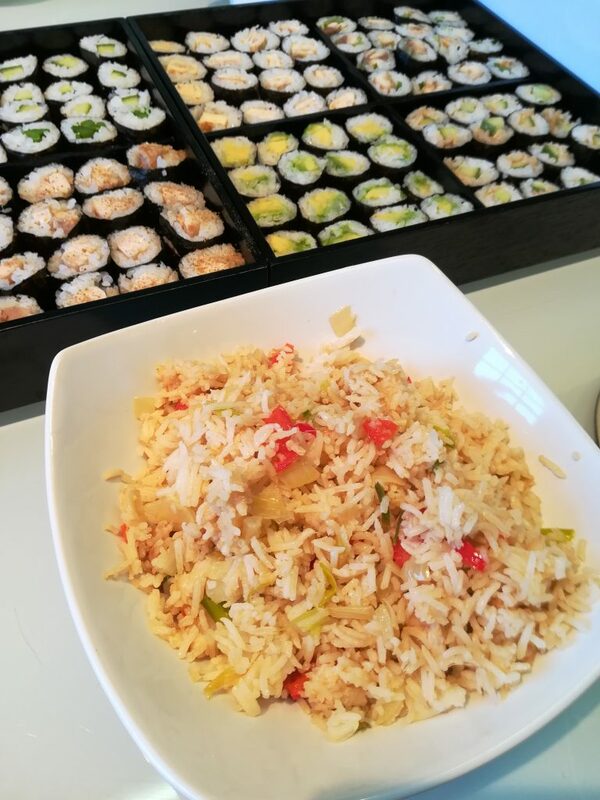 After an estimated 10 hours in the kitchen over the weekend, Adrian (P&W Partner) created a British-Japanese mashup; a tasty twist on a Cornish delicacy. 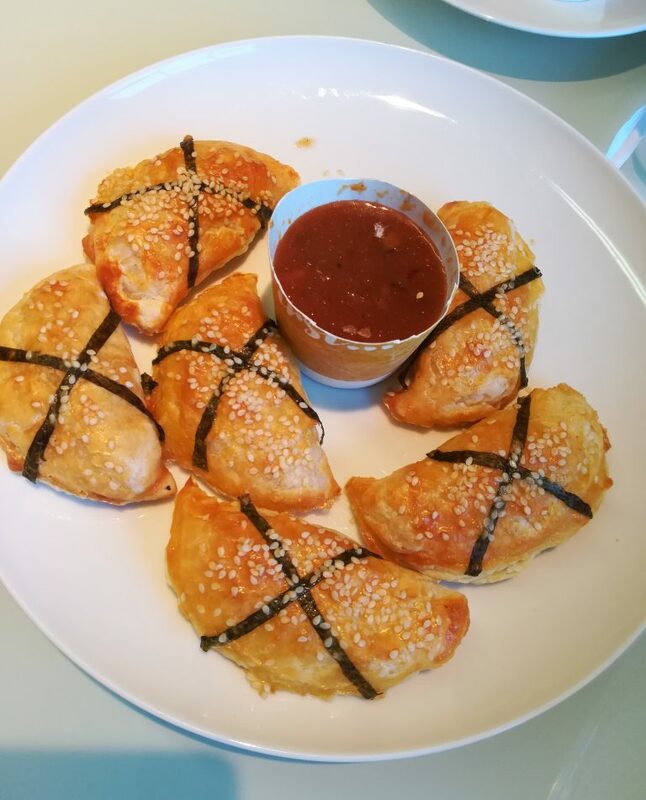 His creations were bite-sized crumbly filo baked pasties with a tasty filling made from miso rice, shredded carrot, miso-baked salmon and Teriyaki sauce with delicate, decorative Nori crosses and sesame seeds. He concocted a delicious dip too from tomato paste, miso, Teriyaki sauce, apple sauce and soy sauce. Our newly appointed Studio Manager, Amanda cooked up a tasty Chinese-style egg-fried rice. As well as the expected rice and egg, she used onions, spring onions, peppers, a dash of salt and a tablespoon of miso paste. Sarah (Senior Artworker & Production Manager) concocted a flavoursome dipping sauce for Akiko’s sushi rolls from: miso paste, rice vinegar, honey, minced fresh ginger, sesame oil, lime juice and toasted sesame seeds. 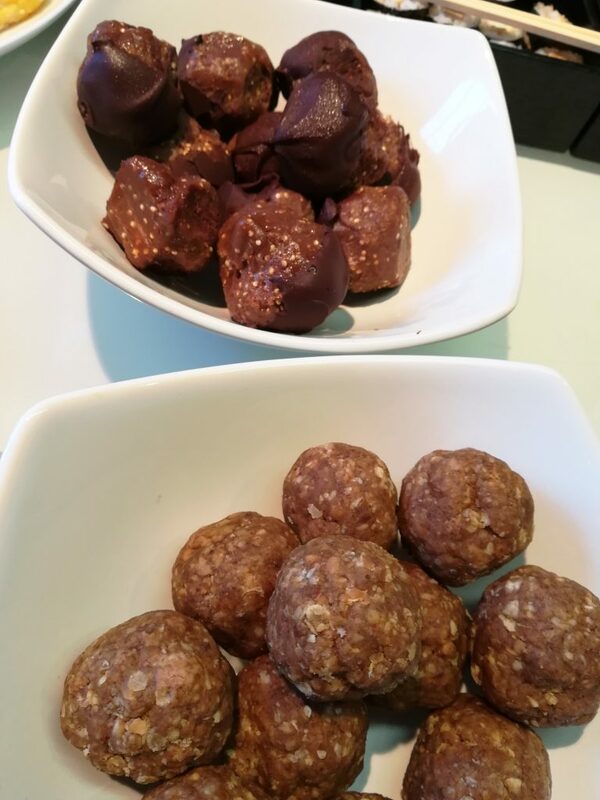 Matt (Creative Designer & 3D Conceptualiser) created two different varieties of super-sticky, protein-rich, no-bake snack balls. His Almond & Coffee Protein Balls were made from almond butter, rolled oats, miso oats, maple syrup, vanilla whey protein and instant coffee and his Chocolate Protein Balls were made from peanut butter, miso paste, coconut cream, maple syrup, chocolate whey protein, quinoa and dark chocolate. Arguably (and most importantly for the many sweet-toothed members of the team), on to the desserts! Amy (Creative Designer) fashioned some fabulously rich dark chocolate brownie bites using a recipe from website ‘The Splendid Table’- (ingredients and recipe found here). The recipe used a generous helping of miso (just over 3 tablespoons). 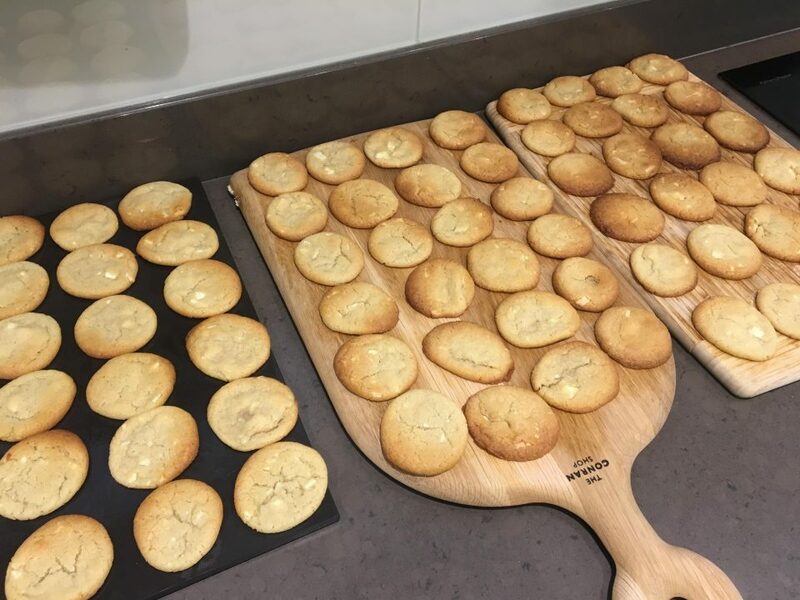 I adapted an American cookie recipe to make a huge batch of very moreish salty-sweet soft and chewy white chocolate and Shiro White miso cookies (i made no-less than EIGHTY cookies!). I used a 1/3 of a cup of miso paste- a pretty hearty portion). I have to say, they are pretty darn tasty! 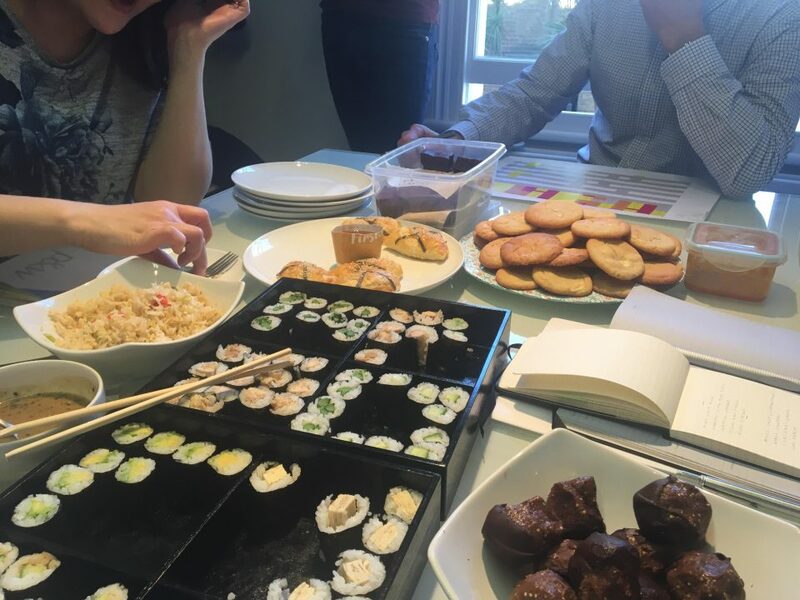 Several other members of the P&W team (those less comfortable in the kitchen) had researched online and shared some found recipe ideas to demonstrate how miso paste can be used in other unique and unconventional ways. Miso Honey Sweet Potato Sorbet is one to try, as is Broccoli-Walnut Pesto to accompany pasta as an alternative to traditional Italian basil pesto. Be Brave- Miso can easily be incorporated into a myriad of recipes (including desserts!) due to its versatility. It can quickly be whisked into a dressing, spread and baked onto fish, made into a traditional soup, drizzled onto roasted vegetables and even blended into cookie dough. The options are truly endless. Never Boil- When you boil miso, you lose key nutritional benefits and the delicate flavour is destroyed, so when using when cooking rice or soup, make sure it isn’t on too high. A Little Goes a Long Way- Miso paste has a very strong flavour and is very salty, so salt should likely be omitted from recipes incorporating it. It was great to see the P&W team come together and make such valiant efforts! Well done and thank you to all who contributed! P&W City Break to Amsterdam!